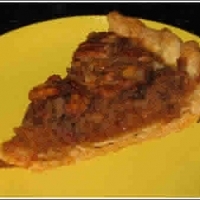 A yummy southern pecan pie. My family loves this simple recipe. Very rich and nutty. In large bowl stir first 5 ingredients until well blended. Bake in 350 degree oven for 50 to 55 minutes or until knife inserted halfway between center and edge comes out clean.